Following on from the previous post, I have done these quick designs for Scrooge and Miss Havisham. By looking at the shapes that I found and looking at the details of all the drawings, as well as drawing inspiration from specific shops, I have managed to produce two designs which I actually quite like. 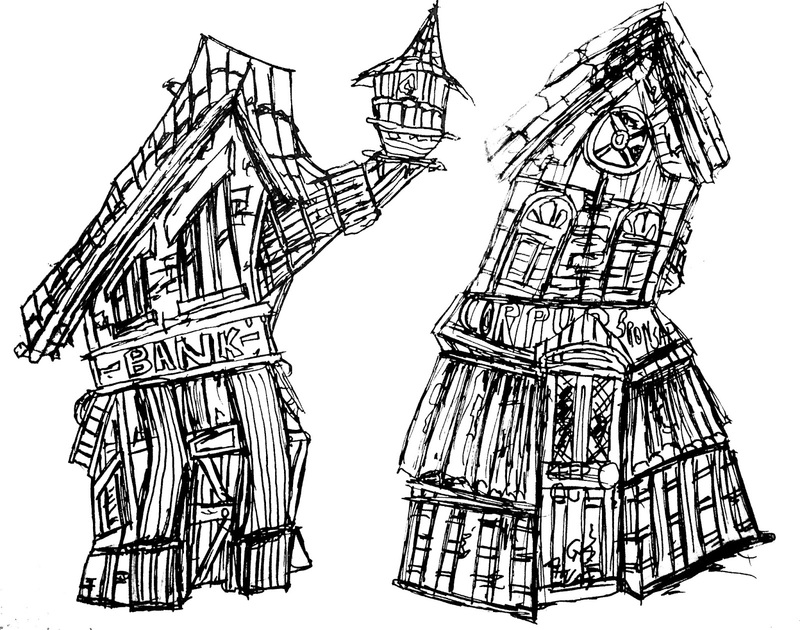 For the scrooge building, Alan metoned the idea of the building being a bank, which is of course refering to the character's greed and lust for money. 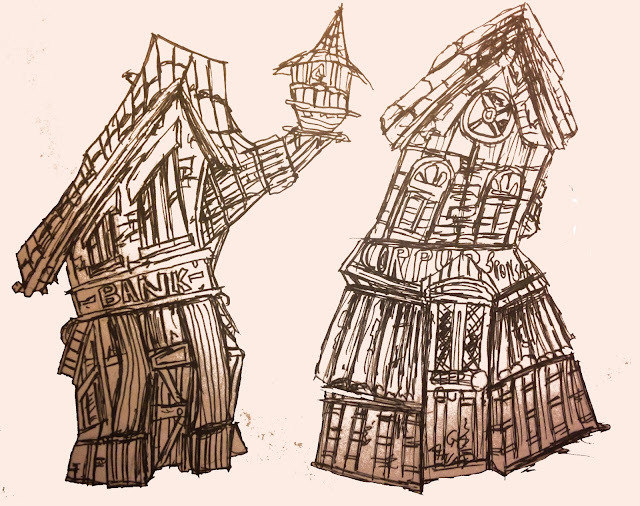 I wanted to keep the pose in tact, as I will intend to for all the buildings, but I wanted it to look like a bank also. The images of Banks nline all seem to have pillars running down them, and so I thought they could be in place of the legs. The arm holding the candle was based on Jack Skellington's house in Nightmare before Christmas. I then made sure that it looked like a building from the Dickensian era, which I personally think it does. Miss Havisham was a little more difficult. I wanted to make her building a Wedding/Bride shop, but with a scary/haunted appearance. It's by no mean a 'nice' shop, but it's not particularly scary yet. I wanted to keep the building's shpe in line with the wedding dress that she wears and I think that shows. On a somewhat different note, one of the things that I've always wanted in my work, or improved, is how pictures are presented. Often, and this is the case for posts in this project, I end up posting plain black and white line images. As I always draw on paper first then photograph my work, so I can edit it in Photoshop after. While doing this, it got to a point where it looked more interesting, I thought. I then changed the background colour to a very light brown. That is the image at the top of the post. I really like this and think it looks better than the one below. Hopefully, I can achieve the same effect with the other designs. Miss Haversham would have tiered elements like a wedding cake.